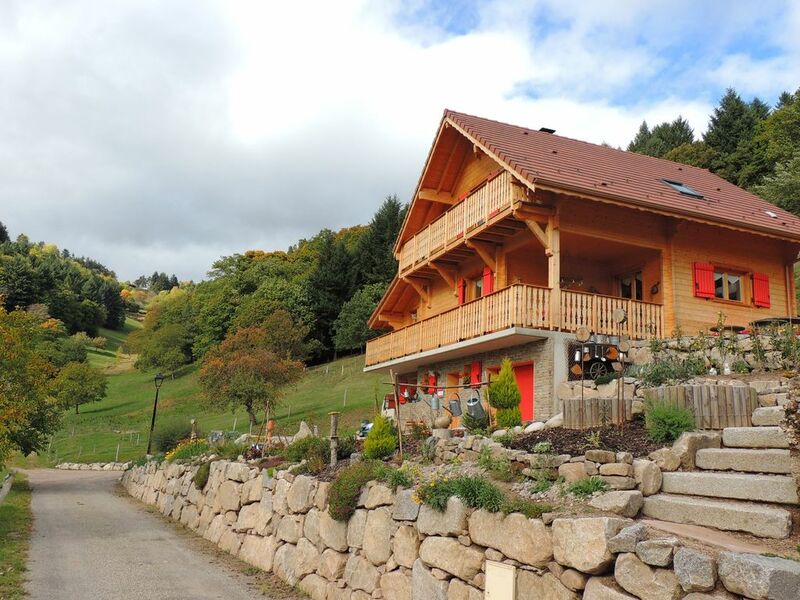 Nature and mountain Alsace Vosges: rejuvenate you "After the Way"
Relaxing holiday, tourist or sports: in a brand new wooden chalet, last house before the meadows and woods, the guest room "Au Bout du Chemin" welcomes you in its warm setting. On the sun slope, with a panoramic view of the Petit Ballon massif, you will appreciate the serenity of the mountain and the countryside just 5 minutes from the small town of Munster, its shops and entertainment. The Vosges ridges and the city of Colmar are less than half an hour, Strasbourg and Mulhouse an hour away. Our guest room has a bed of 160cm, separable into two beds of 80cm if you are not a couple. It is equipped with a bathroom and toilet, hairdryer, kettle, coffee maker and small dishwasher, television, refrigerator, internet connection, separate entrance. A balcony is at your disposal, as well as a terrace and its equipment in the beautiful season. Breakfast is a privileged moment during a stay in bed and breakfast: hearty and varied, it is served in your room in a basket at the time you want. Skiers, you will be 30 minutes from the top of the slopes of the resort of La Bresse. But you will also be close to the small family resorts of the Munster Valley, which will be enough for your happiness if you are not a super-champion, while sparing your wallet. Our room does not accommodate more than 2 people. Our animal friends are not accepted. Beautiful setting, tranquil location, extremely clean room and fabulous breakfast with cute provincial touches everywhere. Owners friendly and helpful. Highly recommended. Beautiful home base to explore Alsace. The accommodations and location are fantastic not only for exploring the Alsace area, but also just to relax. I spent much of my time at the apartment sitting on the balcony overlooking the countryside. Dominique is a fantastic host and made sure I had everything I needed. The breakfast provided was incredible (local cheese, bread, milk, cereal, etc) and more than one person could possibly enjoy. He really goes above and beyond to ensure a good visit. I could not say enough positive things about my experience. I look forward to returning again one day! Très bon accueil de la part de Dominique et Valérie. Des hôtes très prévenants, une vue splendide, dans une superbe région. Nous revenons donc très satisfaits de notre séjour. Freundliche Vermieter, sehr schöne ruhig gelegene Unterkunft, gutes Frühstück und wertvolle Tipps. Liebevoll eingerichtete Unterkunft mit netten Vermietern in toller Umgebung. Rundum empfehlenswert! Thank you, we are happy that you appreciated !